hi thanks for the chainsaws.these guys release anythin' else? I found this for 50 cents at a thrift store in like 1996 and bought it because of the cheap price and cool cover (and crazy SOBs pictured on the back!). No one, not even my older (I'm 30) friends who were "there," have ever heard of this. Wow. i too have a similar story. i bought this at a local record store about 14 years ago. I looked at the cover and was hooked. guys that kinda looked like pirates, then wore boots and braces.....wow....seriously awesome. the music was great and poppy....didn't realize the were part of the "pub rock" scene as some have stated. either way you classify them, they were a great overlooked band, and I would love to find more stuff by them. if i come across more, i will be sure to hit anyone up on here. Excellent mini-LP. 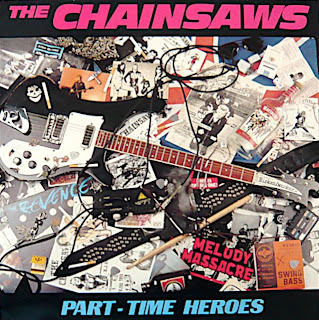 And the Revenge one which is featured on the cover sleeve is just as good - another Brussels group, JJ Burnel was involved, guesting or producing I fail to remember right now. Great blog, cheers.